Hello, everyone and welcome to a new edition of the Daily Stock Watch! People aren’t too high on cards from Ravnica Allegiance but some of them have brought very promising potential in co-existing with old cards. One particular mythic from the set made an old reliable lethal again, as it prompted a price spike for today’s featured card. A timely assist from Saffron Olive helped its cause as well so without further ado, let’s talk about this hot card today. If you’ve been playing Maverick in Legacy for the longest time, you’d know how good this card is. 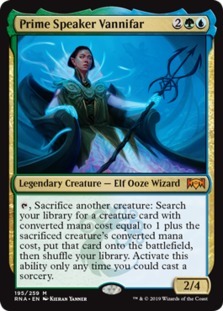 Thanks to this list that our smart folks from MTGGoldfish came up with, Scryb Ranger is now a $5.39 card a few days removed from the arrival of its new master, which is the exciting mythic from the upcoming set Prime Speaker Vannifar. Clearly another Birthing Pod on a stick, this card could easily go off with multiple combos in the deck (I will post the list below) once it hits the board on your opponent’s turn via Chord of Calling, allowing it to set up its sorcery-speed combo powers on your turn. Scryb Ranger will then play an important part in abusing its powers, as it simply allows Prime Speaker Vannifar to go off twice on the same turn without costing a single mana. The list looked a little something like this in Modern, and there are a hundred ways you could go about it in a UG shell in Commander. Get a little creative and craft your own based on this one. Prime Speaker Pod by Ali J. The more linear approach to winning in Modern via Control (UW/Jeskai) or aggro (Humans/Hardened Affinity/RDW) has been preferred more by lots of players lately as there have been lots of ways to suppress decks that look at a single turn combo to win games. The arrival of Prime Speaker Vannifar gives this creature-esque combo approach a new look, and I’m quite sure a lot of players would love to see this deck in action. Scryb Ranger hasn’t been reprinted since it was released, so a $5 investment on it seems fairly decent to me right now. The deck looks promising both in Modern and Commander. You could trust me just as much as the next guy on this as I have been actively playing both formats competitively for the most part of the past few years. There will be an actual use for this regardless if it turns out to be a bust in competitive Modern play. In more ways than what the naked eye can see, these guys are beneficiaries of the powers that having a Scryb Ranger onboard could give your deck. This faerie has been a very strong player for the longest time, and it’s only a matter of time before it breaks through financially once more. This could be the beginning of its ascend towards $10 territory barring an immediate reprint, and things could only look up for it from this point on. I am surprisingly in on it for $5 or less, and I expect better things and results for it as it will open up a lot of new deck ideas in Commander. Don’t expect much from Modern at this point in time — Gut Shot is an actual card in the format that you would probably get hit with a lot. At the moment, StarCityGames and Card Kingdom are both out of stock of this card. They should be back up soon at north of $5 easily. Vendors via TCGPlayer are selling damaged copies at just a shade above $4.50, so you could still try finding decent ones at around that range. Foils are at a premium just above $10, and that’s something that would be great to pick up. This card has proven time and again to be an effective player, and it’s looking like it could be a major player again in a combo setup thanks to the new Prime Speaker.